TREC Collagen RENOVER containing an easily absorbable hydrolyzed collagen and vit. C, aiding the regeneration of tissue. Collagen fibers connect and soften the structure of the joints and skin, providing resilience to mechanical deformation. With age decreases the production of collagen in the body, which may be one reason for the accelerated wear of articular cartilage and loss of skin elasticity. 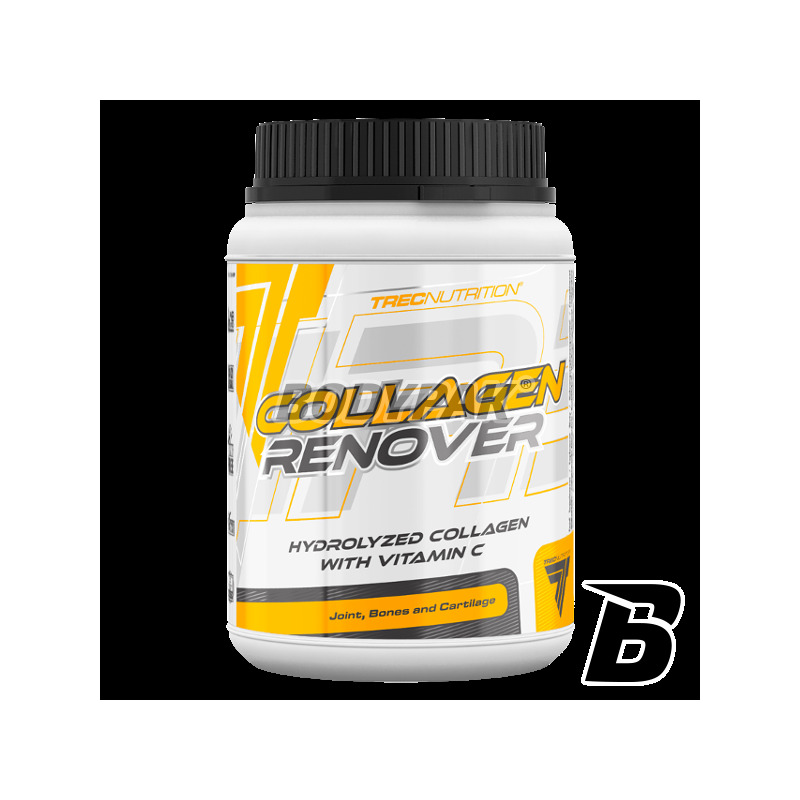 TREC Collagen RENOVER is dedicated as a dietary supplement collagen in people exposed to overloading of joints, including athletes, people who are overweight and the elderly. Movement makes you feel uncomfortable, which limits your daily activities? Do you want to give everything in training, but you are afraid of your joints? Your skin is not as elastic as it once was, and on the surface begins to show stretch marks or the first wrinkles? Take care of your cartilage and skin right now! Fill your diet with an innovative formulation containing perfectly absorbable collagen peptides, enriched with vitamin. C.
TREC Collagen RENOVER supports a comprehensive renovation of the most important components of connective tissue, helping to improve comfort of movement and condition of the skin. Collagen RENOVER contains high grade raw material obtained with advanced process, conducted under strictly controlled conditions. As a result, the natural collagen protein undergoes gentle enzymatic hydrolysis and a multistage process of purification and concentration. This allows for the collagen peptide constructed from the specific amino acid sequence, endowed with extremely high biological activity. Thanks Collagen RENOVER well absorbed and rapidly reaches its site of action. In order to enhance the positive impact of the product on the growth of collagen synthesis, preparation supplemented with the necessary in this process wit. C.
Intensive lifestyle and unbalanced diet may be one of the causes accelerated aging of connective tissue edifying our bones, cartilage and skin. Disorder is a delicate balance between synthesis and degradation forming the structural components. The most important of these is collagen - it was he who unites and firms the connective tissue providing its unique mechanical properties. It is the most commonly occurring protein in our body, which represents nearly 70% of all the proteins that build them. There are as many as 29 different types of collagen, although the body 90% of the types I, II, III, IV, and V collagen is a protein with a unique fibrous structure, by which is unusual resistance to stretching. Built from 3 twisted protein spirals, collagen fibers provide stability and resistance to all structures of the body. Their efficient biosynthesis allows continuous regeneration min. cartilage and skin helping to keep them in proper condition. Like all parts of our body, the structure of the joints require appropriate nutrition and regeneration. Cartilage is a tissue specific composed of chondrocytes (cartilage cells) and extracellular matrix, which is almost 95% of its weight. Chondrocytes naturally oversee the production of building components: mainly collagen and proteoglycan. Under normal circumstances entirely covers the needs of the joints, giving them a smooth and trouble-free operation. However, in the event that often expose them to overload associated with daily activities, sports activities or overweight, cartilage cells can not keep up with the biosynthesis of key components for their operation. Also in this case our daily diet can help the natural repair processes occurring in the joints. Unfortunately, content and absorption of collagen protein derived from common food products is relatively low. The most effective way to increase the natural production of collagen is supplementation in the form of hydrolyzed. That is why the TREC Collagen RENOVER contains perfectly absorbable and highly effective collagen peptides obtained in the enzymatic hydrolysis of collagen. As a result, they have a unique composition, almost identical to the amino acid structure of the collagen builds our cartilage. In contrast to the collagen gel do not form and perfectly soluble in cold water. Collagen RENOVER is also free from the characteristic for normal collagen preparations taste and smell. The product contains only bioactive collagen peptides that much more effectively stimulate cartilage cells to produce its own collagen. During the etching process, they are trapped in the gut and penetrate freely by its walls, reaching the bloodstream. Then through it are distributed where they are most needed. Scientific research confirms that collagen peptides taken orally shortly after ingestion accumulate in the cartilage exposed to overloading of joints, eg. In the knees. Thus cartilage cells receive not only an excellent building blocks for the synthesis of their own collagen, but also a signal for the repair processes. Scientists have shown also that as a result of regular collagen hydrolyzate supplementation not only increases the production of cartilage responsible for the resistance to stretching of type II collagen, but also an increase biosynthesis of aggrecan - major proteoglycan confers resistance to compression. 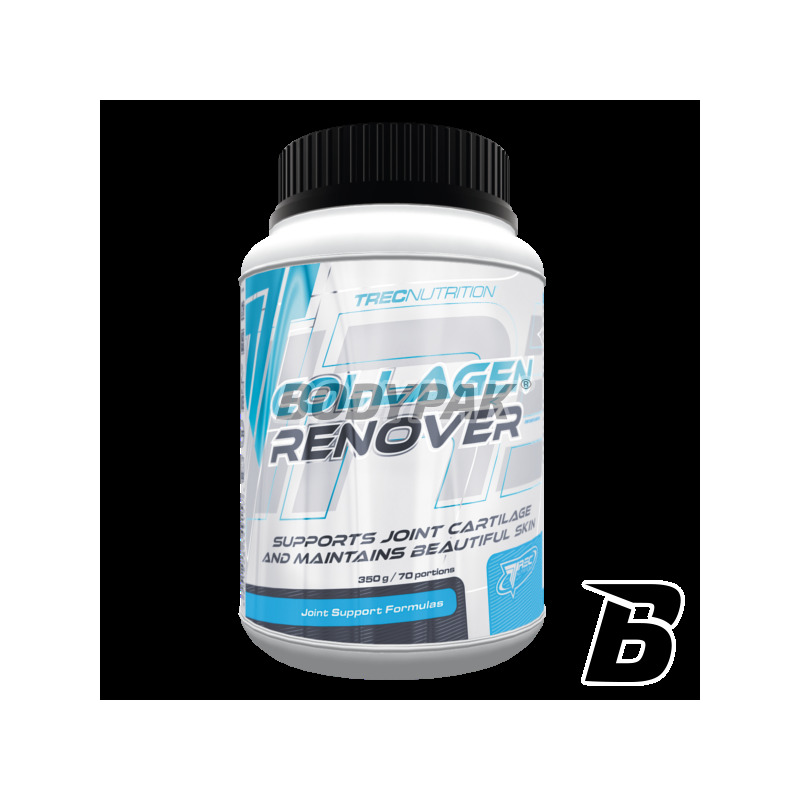 Collagen RENOVER helps to maintain adequate comfort and mobility subject to regular overload of articular structures and may reduce the risk of dangerous injury. Not without reason, collagen is a component of many cosmetics. For years scientists studying its beneficial effect on the appearance and functioning of the skin. Collagen is the major protein component, imparting tensile strength and flexibility. It leaves the skin looking young and fresh, and it is firm and smooth. As in our joints also in the skin with age is reduced production of natural collagen, causing the first signs of aging. There are shallow grooves which are deeper with time and turn into a visible wrinkles. Another problem of our skin, which very often we have to do at a time when rapidly increase our weight (increase muscle mass, pregnancy, obesity) are stretch marks. When the rapidly increasing size of our body, the skin is subject to intense stretching. In such conditions, the cells can not keep up with the production of collagen and in places the greatest stress it loses its elasticity. Interrupted continuity of the connective tissue layer of the skin and creates keloids called stretch marks. Unfortunately, many of the absorption of collagen creams is very limited because it must pass through many poorly permeable layers of the epidermis and dermis. At the same time that a dose once we can apply in this embodiment is small and thus ineffective. Scientists have shown that the best way to supplement collagen is its oral supplementation in the form of peptides. COLLAGEN RENOVER contains a high dose of hydrolyzed collagen, which when absorbed from the gastrointestinal tract tries to our skin cells. It contains bioactive peptides reinforce their structure and stimulate their metabolism to increase collagen biosynthesis own. As a result, the skin is better nourished from the inside, which improves its overall appearance and condition. It increases its density and elasticity, which may delay the process of creating new and deepening existing wrinkles and prevent the formation of stretch marks. 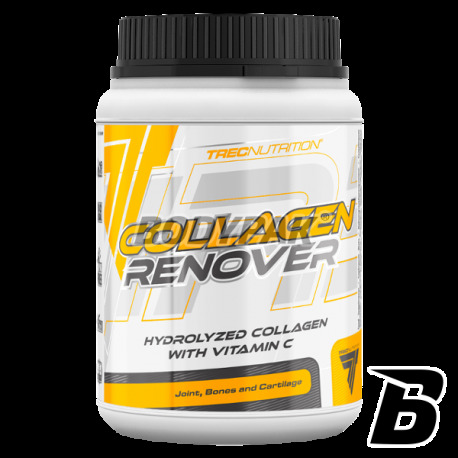 TREC COLLAGEN RENOVER is the highest quality product for the preparation of a delicious drink containing easily absorbable collagen in the form of hydrolyzed and wit. C. It contains bioactive collagen peptides that can promote the regeneration of connective tissue structures in the body and, in particular, cartilage and skin. His regular supplementation helps joint function in people vulnerable to overload (athletes, overweight people, the elderly). COLLAGEN RENOVER is also an excellent nutricosmetic for people who want to improve the appearance and delay the first signs of skin aging. The preparation may also prevent the formation of stretch marks and speed up their recovery. Serving of the product - 5 g (1,5 scoops) in 100 ml of water. Depending on use requirements 1-2 servings per day, preferably 30 min. before meals. Od zawsze mam problem ze stawem kolanowym, dzięki temu suplementowi dolegliwości wyraźnie się zmniejszyły. Podoba mi się formą proszku do rozpuszczania w wodzie, mam smak banan-truskawka i jest pycha! Dobry suplement dla kobiet z problematyczna cerą, mi zdecydowanie poprawił wygląd skóry.